I have done volunteer work nearly every Sunday since 2003 (or has it been since 2002) at an assisted living center, a fact I've mentioned a few times here on TLLG (including a post which you may refer to by clicking here), and since today is Mother's Day, all the residents of The Home wished me a Happy Mother's Day today, knowing I am not a mother of any children, although sometimes growing up I felt like a mother to my own mother, as you may recall in one of my past blog entries here on TLLG — which you may refer to by clicking here. On my way home, I ran into a young woman who asked me, "Are you a mother?" 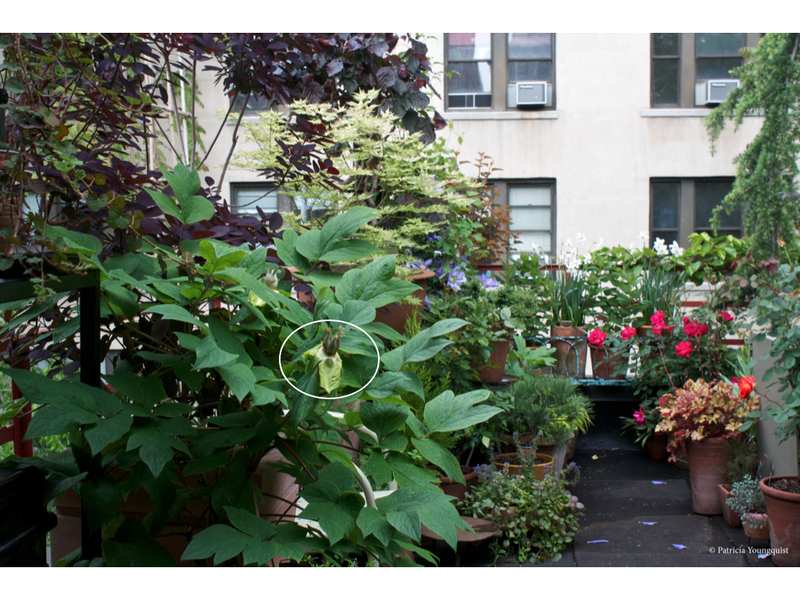 "Of plants and things that grow in my rooftop garden, I am," I told her then asked, "are you?" "Of a dog," she replied. Indeed, I suppose we are all mothers of some living thing or things, and, since for me, the living things are the 80+ things that I grow in my garden, I thought it would be nice to honor them with a group photograph that features some of them as seen in the image posted above. In the lower left hand corner of the image, what remains of my Paeonia suffruiticosa's (AKA Tree Peony) flower can be seen (I've drawn a circle around it for easy reference). My Paeonia suffruiticosa's fate for this 2012 spring season has been well doccumented on TLLG's Facebook Page, nybg's tumblr, and of course here on TLLG. The green leaves above the foliage of my Paeonia suffruiticosa can barely be seen in this image but they wanted their name mentioned anyway, as they belong to a "diva," known as Rubus calycinoides (or Ornamental Raspberry to her friends). She has been featured here on TLLG in nine blog entries to date, beginning with one which you may refer to by clicking here. The striking burgundy color that you see "looming" over the tops of both my Paeonia suffruiticosa and my Rubus calycinoides belongs to the leaves of my thriving Continus Coggygria (also known as Smoke Bush, 'Royal Purple' or 'Grace'). This amazing shrub has been featured in over twenty posts here on TLLG, including one which you may refer to by clicking here. goes beyond communication and that I named for this shrub. The greeting card, 'Grace' (along with several others) can be viewed by clicking here. In this image, to the north of my Continus Coggygria, you will notice chartreuse and creme colored foliage that has hunter green veins (although this particular detail may not be so prominent in this image). This foliage belongs to my Acer palmatum (AKA 'Shisitatsu' Sawa). This tree has been included in half a dozen posts on my blog, including one which you may refer to by clicking here. The burgundy you see behind this tree belongs to the leaves of my Avellana corylus who also goes by Contorted Hazelnut or Harry's Walking Stick). This unique Avellana corylus's was the "poster-child" for my 2011 Christmas card, which was discussed in a blog entry that you may refer to by clicking here. My Avellana also has a "role" in my first garden themed Virtual Story (mini movie), "The Kiwi Speaks! Fifteen Minutes of Fame . . . almost," which can be viewed in my VIMEO Library by clicking here. The hint of copper-colored (it may appear as a light pink on your monitor) foliage in the most extreme upper left belongs to my Physocarpus opulifolius (he also goes by Coppertina or 'Mindia'), and is a tree that has been quite "vocal" on this blog in the posts he has authored, beginning with one on Cinco de Mayo of 2011, which can be referenced by clicking here. Moreover, he had a starring role in my Virtual Story (mini movie), "The Monarch Butterfly Comes to New York", which you may view by clicking here. The purple color in between my Physocarpus opulifolius (and next to my 'Shisitatsu' Sawa) belongs to the flowers of my "fearless" H.F. Young Clematis, a vine that has been featured in a number of blog posts here on TLLG, including one which you may refer to by clicking here. Directly in the middle of the image, to the right of the Physocarpus opulifolius and the left of the Japanese Larch (Larix Kaempferi, whose branches can be seen in partial view at the top right of this image, and who was featured in TLLG blog posts, for his antics in a few posts including one which you may refer to by clicking here) are my Heirloom Original Poet's Daffodils and Hyssop. The Heirloom Original Poet's Daffodils bloomed for the first time this year and were featured on TLLG's Facebook Page, nybg's tumblr and here on TLLG. However, the Hyssop has been around for quite a while, and you may even be recalling how much my visiting bees enjoyed this herb last year, as evidenced on TLLG's Facebook Page, nybg's tumblr, and in quite a number of posts here on TLLG, including one which you may refer to by clicking here. As for the other things in this image, they include my Ajuga, Lemon-Lime Cypress, Blue Shag, Hakanechola Macra (also known as Japanese Forest Grass All Gold), Roses, Actinida kolomikta and Actimida (Kiwi Vines), Heuchera 'Marmalade' (Coral Bells), Succulents, Foeniculum vulgare (Fennel). The other things which I grow are completely off camera. Like yours truly they do not like to have their photograph taken, and I respect that, but I would like to acknowledge them by name. They include the Thymus Serpyllum (Creeping Thyme), Crocuses, Fagus sylvatica (Beech Tree), Farfugium japonicum 'Cristata', Muscari, Salad Greens, Acer shirasawanum (Autumn Moon), Autumn Clematis, Foeniculum vulgare (Fennel), Hens and Chicks, Lavandula angustifolia (English Lavender), Ajuga, Blue Shag, Hakanechola Macra (Japanese Forest Grass All Gold), Heuchera 'Marmalade' (Coral Bells), Pyracantha coccinea (Orange Charmer Firethorn), Oregano, Juncaceae (Juncus), Vaccinium Macrocarpon (Cranberry Vine), Phlox sublata (Creeping Phlox),Allium schoenoprasum (Chives), as well as my Tulips, Actinida kolomikta and Actimida (Kiwi Vines), The Ophipogon planiscapus (Black Mondo Grass) Triplets. Most these have been featured on nybg's tumblr and TLLG's Facebook Page.